Hi friends! Hope you're doing exceptionally well today. So Moorim School is over. It's a sad moment, but on the upside the writers were able to a surprisingly satisfying ending to this series, which is an amazing feat considering they were cut short by 4 episodes and had to wrap everything up rather quickly. I'm not sure if I'll be doing memes for a new drama right away, but I know there are some good ones coming our way rather soon so I doubt I'll be able to stay away for long. Are there any up and coming dramas that you're looking forward to? Jang Geun Suk is making his comeback in Daebak so that should be exciting. Anyway, without further ado let's get right down to recapping these last two episodes. Episode 15 starts as Seon Ah and Shi Woo's dad, Yoon, shows up at the school to see Seon Ah after discovering she's his daughter. Remember, he still doesn't know Shi Woo is his son. 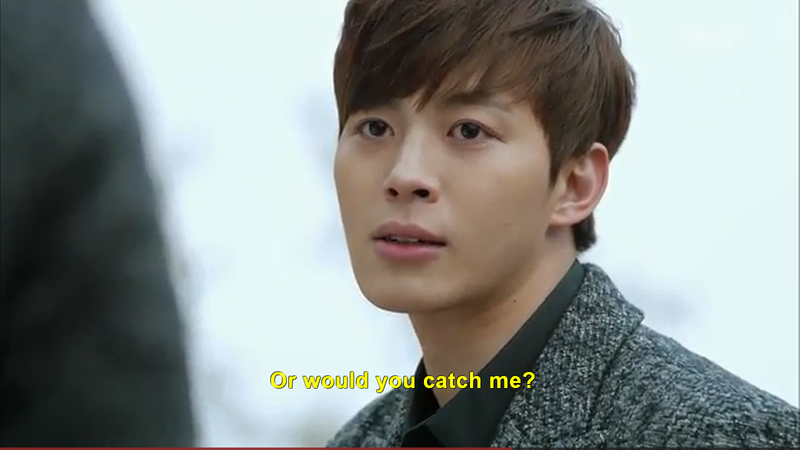 Shi Woo asks him to give Seon Ah some time since she's only just learned of this herself. With Soon Deok gone, Shi Woo is the one who has been looking after Seon Ah and trying to be an emotional support to her. Shi Woo also suggests to Yoon that he may be aligning himself with the wrong people by hanging out with the people from Sang Hae Group and tells him that he believes it wasn't the Dean who started the fire, but that the Dean showed up too late to save them. The Dean is still out there searching for Yoon's son when he visits Soon Deok's dad after learning he might know something. Soon Deok's dad confesses to the dean that Shi Woo is the one he tried to save from the fire, that Shi Woo is Yoon's son. At the school things are getting scary as the new professors are forcing the students to fight with weapons and they are starting to get injured. Shi Woo takes a stand and says that they're not going to do it anymore, that he's going to stop his friends from getting hurt. Chi Ang shows up in China and confront his father about the Chintamani. His father tells him he wasn't involved with the events of 18 years ago. He found out about the Chintamani 3 years ago and has been searching for it since. The Chairman entrusts Chi Ang with the piece of the key that he has. Meanwhile the Dean decides to share the information he learned about Shi Woo with the leader of the Moorim assocaition, believing him to be on his side. It turns out he's not. He's Juk Poong (the bad guys). Soon Deok's dad shares with Soon Deok what happened the night of the fire and she is heartbroken and feels that what happened to Shi Woo is her fault because her father was worried about her safety. Seon Ah has finally come out of the daze of shock she was in and thanks Shi Woo for supporting her. The other students are happy to see that she's back to herself. She and Shi Woo find a note that Soon Deok left behind letting them know that they're siblings. They both are shocked but realize the signs have been there all along. They agree that it's foreign concept to them and that they'll take developing their relationship slowly. They also discovered that Soon Deok has left town and disappeared. The Dean shows up to a trap lead by the Chairman and the leader of the Moorim Association. Meanwhile Yoon was supposed to be off somewhere meeting with the leader, but Shi Woo had planted the seeds of distrust in him. This allowed Yoon to remember 18 years ago that it was the leader of the Moorim Association that started the fire. So Yoon had followed the Chairman. Yoon shows up and helps the Dean fight off the bad guys and it looks like they're winning until the evil henchwoman of the Chairman stabs the dean. Yoon takes the knife out of the dean and stabs the woman with it. He tells the dean to hold on and that he's sorry for doubting him and not coming to find him sooner. The dean, thinking that he's dying makes sure to tell Yoon right away that a student at his school named Shi Woo is his son. The students at Moorim are gearing up to protect their school and Chi Ang is seeing his mother off to China. She reminds him that his happiness is important and he can't be happy through someone else's happiness. Seon Ah finds the evil dean going through Shi Woo's room and lets him have it. The other students are there to back her up. But then Yoon shows up with the good Dean. The evil professors attack them and try to stab the dean, but Yoon uses his powers to stop them and everyone is impressed. Truly, he is Shi Woo's dad. When Chi Ang finds out that Shi Woo is Yoon's son, he realizes that Shi Woo's necklace was part of the Chintamani and that Soon Deok now has it. We resume episode 16 after Yoon stops the bad guys from stabbing the dean. He looks right into the face of the new dean and makes it clear that they're not going to let him take control of the school anymore. All of the students of the school step up alongside of Yoon and the evil dean realizes there is no winning this battle. Both Shi Woo and Chi Ang are searching for Soon Deok knowing that she has the Chinatmani. I was a little disappointed when Chi Ang tells his dad that Soon Deok has the Chintamani when he knows that'll put her in danger. But he's confident he can make sure she's unharmed and tells the guys to find her but not touch her. They find her just before Shi Woo does. Chi Ang takes her aside and asks her to come with him and tells her he could force her, but Shi Woo shows up and steps in. He tells Chi Ang he'll give him both piece of the Chintamani that he has, but he won't give her Soon Deok because the people he cares about are more important than power or a silly little item to him, and the people that he cares about includes Chi Ang. They agree to meet at Moorim Peak the next day. Shi Woo and Soon Deok return to the school and I finally get the tearful father-son reunion I've been waiting for as Shi Woo meets his dad for the first time. It's seriously heart-warming, friends, it really is. He asks his dad to trust him and let him give Chi Ang the key. And even though he doesn't really know his son, he trusts him which is a crazy parallel to relationship between Chi Ang and his father. Even though Chi Ang asks his father to let him go alone, his father sends his men who are waiting at the top of Moorim peak which puts Shi Woo in danger. 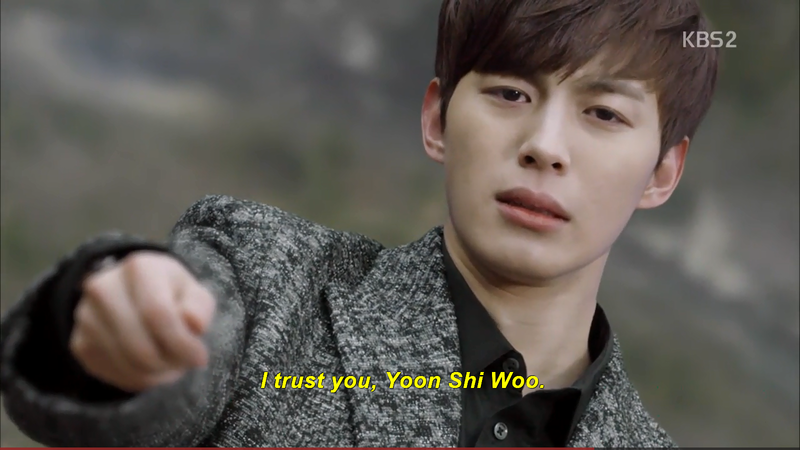 When Shi Woo gets to Moorim mountain, he did come alone, and Chi Ang intercepts him before he gets to the top. 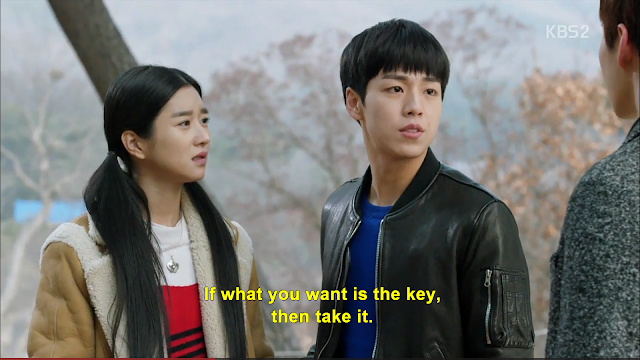 Shi Woo's faith in Chi Ang has been unwavering and he gives him the 2 pieces of the key that he has, making a complete key between the two. It turns out that Shi Woo's faith in Chi Ang was warranted as Chi Ang has only been taking the path he has in order that his father might come to his senses and be redeemed in the process. Chi Ang asks Shi Woo to trust him. Chi Ang meets his father at the top of Moorim peak and shows him that he has the key. His dad cannot hide his excitement, but Chi Ang issues him a challenge. Does he care more about the key or him? Chi Ang states that he has discovered there are people that actually care about him and that he can actually trust at MoorimHe asks if both fell of the cliff, which would he save? When the dad can't answer, Chi Ang falls backward off the cliff with the key. But Shi Woo and his powers are waiting at the bottom to save Chi Ang in the event that his father does not. Chi Ang is only hoping for his father's redemption, but what he truly trusts is that his friend will save him. Isn't that beautiful? At first is looks as though Chi Ang's dad has forsaken him as he begins to tumble, but then his dad arms grasps his as they both fall of the cliff. But Shi Woo is waiting there at the bottom for them with a smile. The next scene flashes to 7 years in the future. Seon Ah is now the dean of Moorim School and Soon Deok is a professor there. Shi Woo is still a successful singer and his favorite place to write his songs are at his old room at Moorim and is still such good friends with Chi Ang that he sends him multiple emails a day. Chi Ang has now taken his father's place as Chairman and is supporting Moorim. Seon Ah in her role as Dean along with her biological and adopted dad as the previous deans go to visit Chi Ang to collect his annual donation. They all have a playful and happy relationship as they meet up. It turns out that Seon Ah and Chi Ang are now dating and make the most adorable couple. And as far as Shi Woo and Soon Deok, they're engaged. All of the other Moorim students have become successes on their own right in one way or another and Shi Woo has sent them all invitations and knows that everyone, even Yeob Jung to come back for their wedding. Moorim, after all, is a family. Some people felt that the ending was rushed and to a degree it was, but that's to be expected. They had to cut it short by four episodes. However, it did not feel unnatural to me at all. Everything that happened in the ending was fully supported by the characters' behavior throughout the rest of the series.In fact, I was incredibly amazed how well they were able to tie everything up. Most dramas don't tie their endings up this well, let alone ones that were cut short. Take Yeob Jung for instance, in the end we're led to believe that he's still close with the other Moorim students yet the last line he had he seemed to be against them. But if you watch his expressions and his hesitation and the moments he'd had throughout where he'd help the others - the fact that he wasn't really all that bad is totally supported and believable. I think we all need to take a moment here and give a big round of applause to the Moorim writers. They are seriously superstars in my book. Moorim School is a cliche-shattering drama. It is a bit ahead of its time and maybe that's why it's not appreciated by everyone. There are some criticisms as far as the acting and production value. To me, I did not see an issue with either. I found both to be in line with the style of the drama, but that's just my opinion. This is the first Kdrama I've seen with such a diverse cast, with characters of different ethnicities who are an actual part of the story and who aren't just there for novelty purposes. The message that it sends is a powerful and important one of protecting the ones you love and putting people over power. It was beautiful to see the amount of love Shi Woo had for his friends and family and the amount of trust he put in them. For an action fan, the action scenes may have been disappointing. Personally, I loved the style of action in this drama as it really allowed you to pay attention to the characters' emotions during their fights and not just the moves. From the different people I've talked to it would seem Moorim is one of those dramas you either love or hate. However, the majority of people I've talked to seem to be fans. So if you haven't watched this drama yet I would definitely recommend giving it a try. Even if it's not your favorite drama, I think everyone can agree that it's unlike any drama that's come before it. Catch up on all my Moorim recaps here on my Moorim School homepage. I did too! It was a seriously underrated drama and unlike any other Kdrama I've ever seen. Day 12 - Best Mom: Park Sun Young from Cheer Up!